A painful song in the voice of Abhishek Bharthare and music composed by Bishwambhar Yadav. The video of this song is available on YouTube at the official channel unisysmusic. This video is of 6 minutes 36 seconds duration. 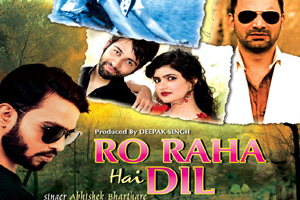 Lyrics of "Ro Raha Hai Dil"
Lyrics in Hindi (Unicode) of "रो रहा हैं दिल"